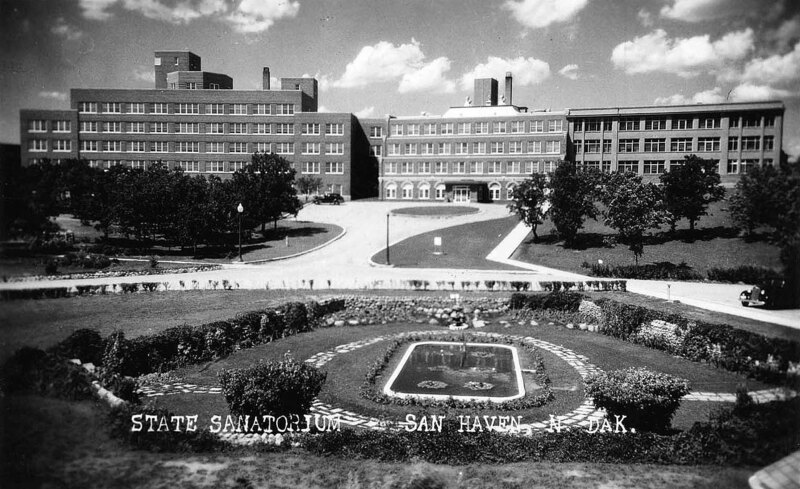 The San Haven State Hospital, originally known as the North Dakota Tuberculosis Sanitarium was opened to the public in November of 1912. Located in the Turtle Mountains of Rolette County, it was thought that the higher altitude and drier atmosphere would be favorable to patients with tuberculosis. In the 1950’s, after antibiotics brought some control over the tuberculosis epidemic, the hospital remodeled, expanded, and ultimately opened its doors to the developmentally disabled and elderly. As with many state hospitals, rumors and questions regarding the treatment of it’s patients began to circulate and the hospital would eventually close in December of 1987 after a lengthy lawsuit. This once elaborate and expansive hospital now sits in ruins; only a ghost of it’s former self. A popular attraction for teenagers, there are an abundance of rumors regarding the presence of paranormal phenomenon, which only adds to the mystery and appeal. Even if this isn’t true, it is impossible to stand on the expansive and overgrown property and not feel emotional in some regard. Standing in a building that looks almost post-apocalyptic, you can’t help but imagine the hundreds of people that walked those long halls. How different it must have been to see with the windows unbroken, the doors still attached to their hinges, and fresh paint covering the walls. I will let the pictures do the talking this time; all you have to do is listen. While preparing for a trip to North Dakota last September, I found myself randomly browsing google for possible locations. While I spend more time perusing google aimlessly than I would like to admit, this time it certainly paid off. I came across an image of a dusty bookcase filled with old textbooks. Obviously, with my love of books, not finding this school was not an option. With many more hours and some hints from fellow explorers, I found myself making the six hour journey to Nome, North Dakota. While not exactly on the way to our final destination of Devils Lake, every extra minute was worth it. The Nome school was opened in 1916 and was only in use until sometime in 1966. The image below was originally used as the cover of the school Annual and was taken sometime in the 1950’s. Nome saw it’s population peak just prior to this time with the 1940 census recording 277 residents. Since then, Nome has seen a steady decrease in residents with current estimates almost below 60. It seems the residents have taken notice to the steady decline of their home as well. The first sign that greeted us upon entering Nome stated: “slow down, we are still here”. Even the school is failing to make it’s presence known as it is slowly suffocated by trees and shrubs. If you weren’t looking for it, it would be almost impossible to see this hidden gem from the main road. After making our way through the brush and climbing over various kinds of debris, we found ourselves greeted by glass paneled double doors and a grand wood main staircase shrouded in darkness. Once we climbed higher, we were able to finally see the beautiful decay that is the Nome School. Everywhere you look, you are greeted with huge glass windows, carved wooden banisters and cabinets, antique cloth chairs and black metal desks, glass vases and porcelain figurines, dusty books and used suitcases, rotting world maps and faded chalkboards. In central North Dakota sits the almost deserted town of Eldridge. With nothing but a few houses and no more than a dozen residents left, Eldridge is barely hanging on. The only reminder that this was once a fairly populated city is the ghost of a school nestled away in the far corner of town. Someone has certainly taken measures to try and preserve this brick beauty, but like many other old structures, teenagers have found their way inside and have certainly made their mark. Beer cans and destroyed furniture can be found in every room, but even so, you can’t help but marvel at the carved wood room dividers and the love that must have gone into building this school. As if the room dividers weren’t enough to make me swoon, once we gained the courage to climb the pitch black staircase, my fellow explorer and I were greeted by even more beautiful details. Between the glass pained and carved trim to the intricate doorknobs and rusty hooks, I had to just stand there for a moment and take in what once was. Even the peeling walls hold their own simple form of beauty. Although this old school will likely never be saved from it’s dark fate, it certainly provides a little glimpse into another age. I may be “old fashioned” for someone so young, but I can’t help but wish every building was given so character and personality.